It is with great interest that I read a story on AppleInsider.com titled After initial success, magazine purchases on Apple iPad decline - talking about how magazines on iPad haven't achieved the success that was predicted for them. With the global magazine industry threatened by visions of the print versions of their magazines going the way of the dodo, the magazine community has spent significant dollars on creating amazing, rich media digital magazines on iPad. 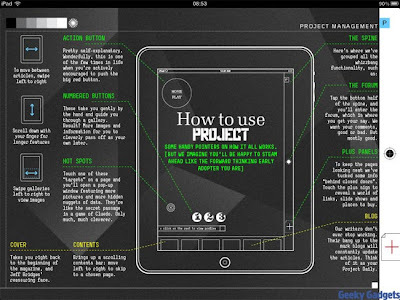 One only has to open Wired's iPad app to see how much work has been put into the iPad version and Richard Branson's Project iPad app went even further with integration of video and amazing interactive advertising and yet it also seemingly has suffered from a lack of take up from the iPad user. Its has been said in the boardroom of many a magazine publisher that perhaps this investment has been made "too early", or has been a wasted chance to build the magazine's brand on a smartphone type device. Could it be that the technophiles behind the creation of these apps have let the tech run away with the fundamental premise of how users want to consume magazine style content. It didn't take much time with a range of these apps to write down 5 fundamental issues with the way these apps work that are kind of obvious to any magazine subscriber. Downloading of content - unlike the magazine that you purchase at your local news stand or have home delivered, these apps require you to initially download a "shell" that is then used to allow you to download magazine issues. For many an iPad user the time it takes to download the hundreds of megabytes of data is a significant impediment to viewing the magazine. That together with the way people use the iPad - which is a kind of "information grazing" approach with one app being open, then closed to do something else, then back to the first app - means that often the user will not get a chance to download their first edition of the magazine for many hours and forces users to leave the device with the app open overnight. Not an ideal way to quickly consume magazine style content. More is not more. To a fault the iPad magazine tries hard to include as much "eye candy" as possible to (in the mind of the developers) create a new compelling experience on device. What this often does is simply takes away for the quality of the article or photograph that has been carefully crafted for the paper based magazine. Developers need to understand that old publishers saying "less is more" - as otherwise they risk overwhelming the user and making the app boring and a simple showcase of iPad graphic capabilities - to create return readers its the content that rules, not the iPad graphics. Advertising. Where is the value? By moving the iPad magazine away from a traditional "Front to back reading" approach to a "go anywhere anytime" the iPad magazine has removed the ability of the publisher to charge a differentiated fee for advertising by its placement within the publication. Advertising and per download fees will both be required in the future to create a viable commercial structure for iPad (and other table) versions. App developers need to go back to basics to create a way of allowing publishers to monitise content in more traditional ways. The good old double page spread. We have yet to see any examples of iPad magazines creating a concept as powerful as the double page spread. Advertisers love creating special content and readers find the spread something that catches the eye and makes one "linger" on it. Give aways and bundles. Where are the "free tote bags" or "free CDs" that have been a successful mechanism for driving news stand purchases? Consumers need constant reminding and encouragement to purchase these magazines again and again. Traditional marketing works. App developers just need to implement a way of offering a similar structure for their users in the digital age. Overall I think that magazine publishers and users are still very excited about the use of the iPad (and other tablets) as tools for delivering content. These first few versions of the iPad magazine have been great pointers to what works and what doesn't work for the mass market of users out there who are thinking of spending their hard earned money on this new way of getting the content that they value in a way they want to consume it. Ipad is an amazing invetion from apple.Its has many flaws and drabacks too.Apple should consider those things.It doesnt have camera even.I was shopping for ipad on online shopping when i came acros with different blogs.Do check it out for many other products.Ipad and blackberry books are both the same.Blackberry book comes with many new feature while ipad lacks sum functions.